The small Somme village of Courcelette was captured by the Germans in September 1914 and would remain in their hands until it was liberated by Canadian troops in the Battle of Flers-Courcelette, when Tanks were used for the first time, on 15th September 1916. The Germans turned one of the village chateaux into a field hospital, built a substantial cemetery which eventually had more than 2000 burials and utilised the Sugar Factory close to the main Albert-Bapaume road as a strong point. 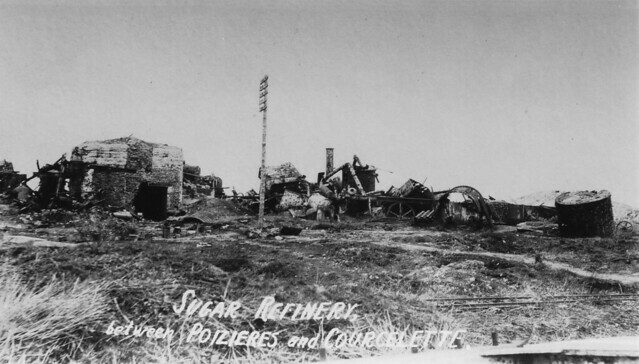 This image of the Sugar Factory is one of a small collection taken by a Canadian veteran when he toured some of the sites where he had fought in 1919. Sugar Factories were commonplace in France at the time of the Great War; sugar beet was a major crop and almost every village processed them as part of the sugar trade. Today such factories are rare and the rebuilt Courcelette Sugar Factory has been a garden centre for many years. This entry was posted on 01/03/2012 by sommecourt. It was filed under Battlefields, France, Great War, Somme, Western Front, WW1 and was tagged with 1916, Courcelette, Picardy, Somme. do you have his full collection of pictures? I’d be very interested to see them all. The Sugar Factory is mentioned in Kipling’s fine short story about the Great War, The Gardener.